UCSC history professor Dana Frank reporting on protests in Honduras on the anniversary of the June 29, 2009 militrary coup. 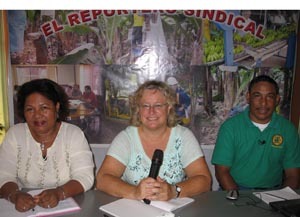 Professor Frank (center) on local television in Saba, Honduras, discussing women’s projects in the banana unions of Honduras. In late June, UC Santa Cruz history professor Dana Frank traveled to Honduras to observe the one-year anniversary of the country’s 2009 military coup that deposed President Manuel Zelaya. 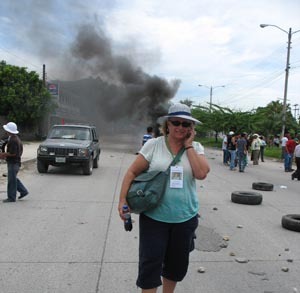 Walking through the city of Choloma in the early morning hours, she watched as a broad coalition of protesters--including members of trade unions, women’s groups, campesinos, and human rights groups--blocked the main highways and bridges, creating barriers out of burning tires and branches. Frank is one of the top academic experts on Honduras in the United States. For the past year, she has been commenting on the volatile situtation in that country for media ranging from National Public Radio, to the Chicago Tribune, to the Associated Press(where she has been regularly interviewed by award-winning journalist--and UCSC alumna--Martha Mendoza from the AP’s Mexico City bureau). Frank has spent the past 10 years researching the area. And while Honduras may now seem to many people in the U.S. as just another vague political hot spot in a troubled world, the region is very real to Frank--particularly after she found herself wondering if she would be allowed to leave the country after filing several reports on opposition protests for The Nationmagazine. “It was a real shock to go from working in a place that nobody paid attention to, and then abruptly seeing news about the country displayed frequently in the New York Times,” said Frank. Frank soon made herself available to the media and began talking to members of Congress, such as Sam Farr, about U.S. policy in the region. She also contributed a number of op-ed pieces about the ramifications of the coup to such media outlets as the Los Angeles Times, Huffington Post, and San Francisco Chronicle. Frank is the author of Bananeras: Women Transforming the Banana Unions of Latin America, published in the U.S. in 2004, with a Spanish edition released in Honduras in 2005. She received the "Book of the Year" award from the International Labor History Association for her previous book Buy American: The Untold Story of Economic Nationalism. Frank was also honored with an Excellence in Teaching Award by the UC Santa Cruz academic senate’s committee on teaching in 2001. Currently doing archival research and interviews for an upcoming book on the history of the U.S. labor movement’s intervention in the Honduran labor movement during the Cold War, Frank noted that she is often concerned about the safety of her sources in Honduras. “But it’s very impressive the way ordinary Hondurans continue to assert their basic democratic rights and civil liberties,” she added.